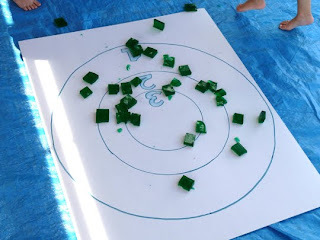 Inspiring Ideas with artist Jeanne Winters: "Messy Boy Party" Part 2: Let the GAMES begin!!! 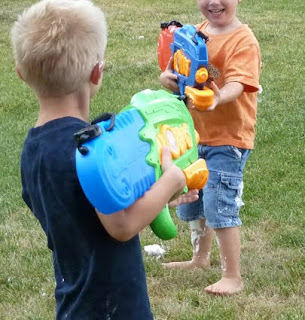 "Messy Boy Party" Part 2: Let the GAMES begin!!! WooHoo!!! Messy Boy Party is all about the games!!! 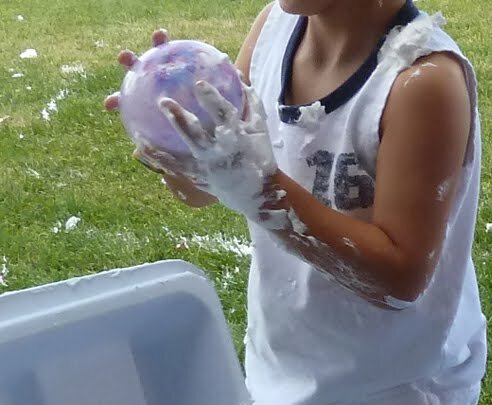 My previous post was about my son's 4th birthday party, a Messy Boy Party to be exact. This post is all the fun messy games! We had an odd number of guests, so instead of tossing to each other, we used a traditional bull's eye target on the ground ... which was covered with heavy duty tarp to contain the spillage. They took turn throwing jello jiggler squares at the target, trying for the most points total. Note: none of our games had "winners." The boys were going for total points in order to win - as a group - the chance to uncover the secret prizes. More on that later. I had my hubby man the chalkboard scoreboard and "tally" up at the end of each game. Remember, these are (mostly) 4 year olds, so he was free to score at whim as they eagerly awaited the results after each game! Adorable. OK, no. 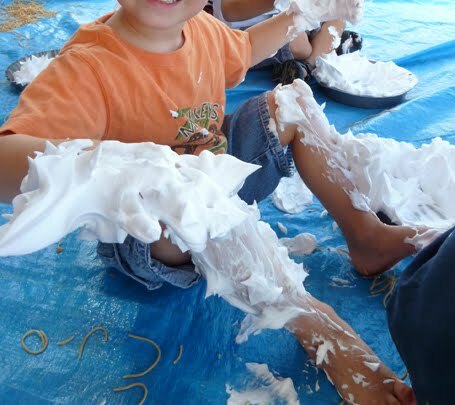 There was no shaving cream fight. These little guys were way too nice for that! 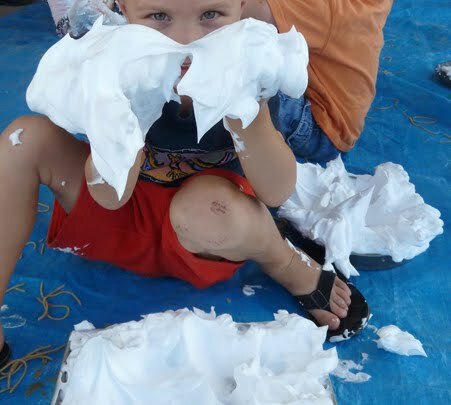 We simply filled pie tins with the shaving cream and sat them each down to play as they so choose. 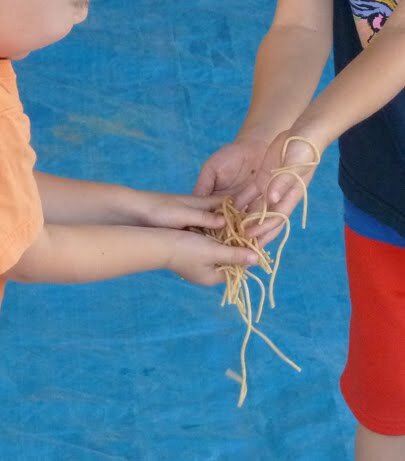 Now, the funny part was, the boys really didn't get too messy with it!! BUT, birthday boy's sister and one of the guest's sister who joined in went HOG WILD!! Is this a girl thing? The boys covered some arms, legs, hair, but not a spec of clothing, while the girls covered EVERYTHING!! 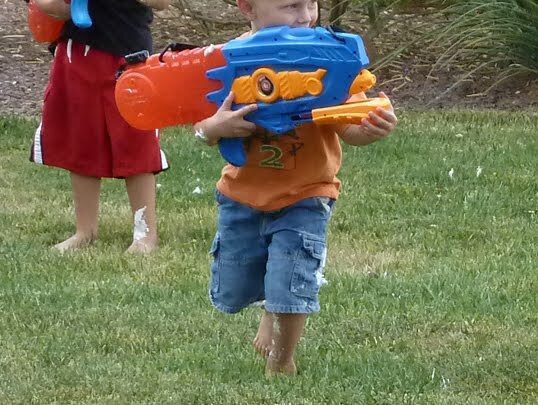 NOW they were ready for some serious action! They could clean the remaining shaving cream off each other all they wanted! Meanwhile, the 2 girls (and 1 boy) had headed back to the tramp. What do you think they soon asked for? MORE SHAVING CREAM!!!!!!!!!!!!! 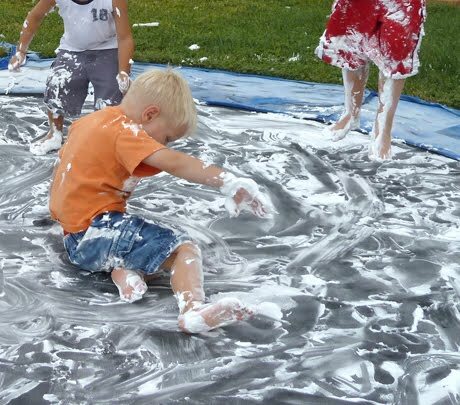 Pretty soon everyone was back on the tramp, slipping, sliding, spraying, running and jumping! After most of the messy shaving cream had evaporated or been wiped off, they jumped in the pool! 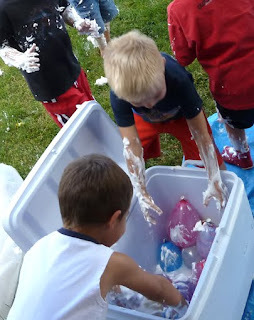 Please, share your fun game ideas in the comments so this post will be a good resource for others wanting to do a "Messy Party" theme for their event! Next time: the ICE CREAM BIRTHDAY CAKE and the recipe so you can make one, too! Looks like a blast. and it must be a girl thing cause I do believe that I would have totally covered myself and others in shaving cream :) haha! Wow! How fun and creative!! Sounds like fuN! I will definitely be refering back to this when my son gets older! What a great idea! 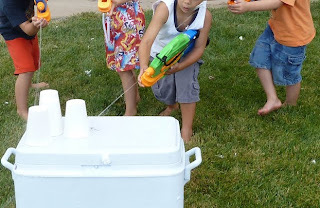 I'm thinking I might use some of these ideas for my son's 4th birthday, he loves to get messy! I can't wait to try this with my grandkids! Thanks for posting! 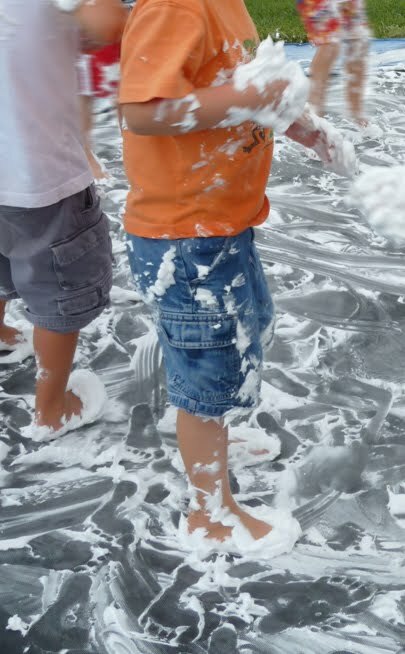 It's funny you mentioned the girls were more into the shaving cream than the boys. I work with teens and girls are ALWAYS more willing to get messy than the boys. We always get a ton of girls who volunteer to do our mud activities, or whipped cream games, messy olympics whatnot... and usually only a handful of guys will step up to the plate. 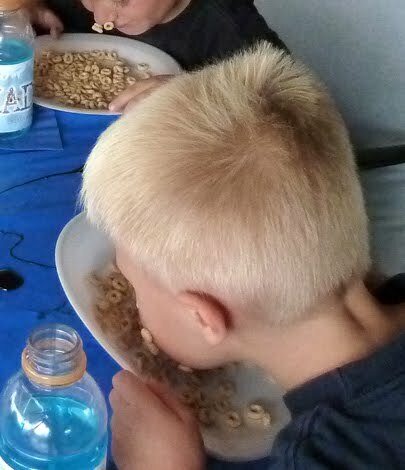 I'm not sure where the stereotype that boys are messier than girls comes from, my brothers and my boyfriend hate being messy or dirty - and I love it!